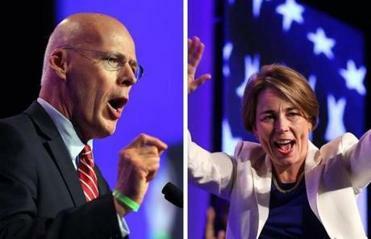 Martha Coakley maintains her lead against rivals Steve Grossman (left) and Don Berwick (right). 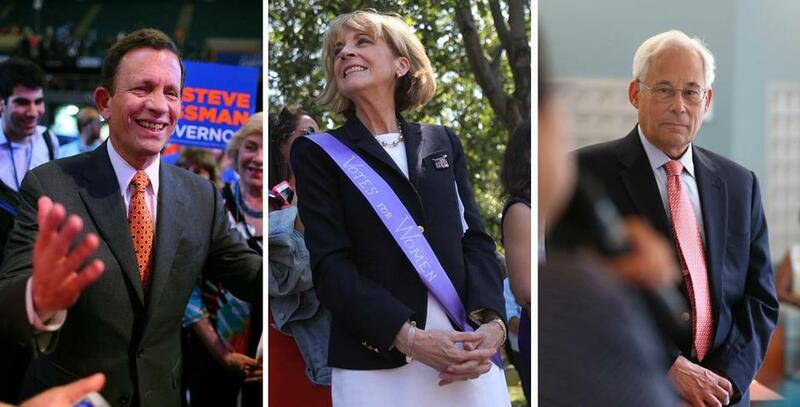 The final Globe poll before Tuesday’s Democratic primary shows Martha Coakley maintaining her strong lead for governor over Steve Grossman and Donald Berwick, but in the race to succeed Coakley as attorney general, Maura Healey has surged out of a dead heat with Warren Tolman to claim a 15-point lead. In the governor’s race, the candidates’ standings remained largely consistent. Coakley continued to lead the pack, with 43 percent support, compared to 23 percent for Grossman and 13 percent for Berwick. But when undecided respondents were pressed to say which candidate they’re leaning toward, Coakley’s support climbed to 47 percent, Grossman’s to 25 percent, and Berwick’s remained at 13 percent. Fourteen percent remain undecided. Healey, a former assistant attorney general, now leads Tolman 42 percent to 27 percent among voters likely to vote in Tuesday’s primary, the poll found. When undecided voters were pressed to say which candidate they’re leaning toward, Healey’s lead grew further — to 45 percent compared to Tolman’s 29 percent. The Healey surge represents a big change from last week’s poll, which showed the rivals in a dead heat at 30 percent each, with 40 percent undecided. This week’s poll found just 27 percent of respondents undecided. Women in particular have started to turn Healey’s way, the poll found. While Healey led Tolman among women voters 31 percent to 28 percent last week, a gulf opened up in this week’s response: Women supported Healey over Tolman 49 percent to 23 percent. Republican John Miller is running for attorney general on the Republican ticket. The Democratic primary race between Warren Tolman and Maura Healey is one of the most exciting races on Tuesday’s ballot. Read: Quiz: How much do you know about the candidates? John Della Volpe, chief executive of SocialSphere Inc., which conducted the survey for the Globe, noted that Healey had a good week on the campaign, gaining recognition from a TV ad and claiming the Globe’s endorsement. Her campaign also created a dust-up over gender-loaded language last week when Tolman used the word “unbecoming” during a debate. Though his utterance went largely unnoticed, it prompted a fierce response from women’s political groups who took to social media and raised concerns of sexism. Healey’s supporters used the word in a fund-raising plea and elicited an apology from Tolman — despite cries of opportunism by Tolman defenders who noted he was responding to Healey’s particularly aggressive line of questioning. It was unclear how much the “unbecoming” debate affected public opinion or whether it affected Tolman’s favorability rating, which was not measured in this poll, Della Volpe said. But more broadly, he noted that women voters have been settling on candidates in the lower races as the primary nears — and they seem to hold the key to several contests, particularly for treasurer. In the Democratic race for treasurer, Barry Finegold continues to hold a slight lead, with 21 percent support compared to 15 percent for Deborah Goldberg and 14 percent for Thomas Conroy. Include the uncommitted voters who say they’re leaning toward one of the candidates and Finegold’s lead jumps to 23 percent, compared to Goldberg’s 18 percent and Conroy’s 15 percent. Forty-four percent of likely voters remain undecided. The winner of the primary for treasurer will face Republican Mike Heffernan in the November general election. Look more closely at the Democratic primary in that race, and it becomes clear thatfar more women (50 percent) are undecided than men (36 percent). That leaves an opening for any of the candidates. Currently, Goldberg does not show an advantage among women voters. But she could benefit if female voters who are unfamiliar with the candidates decide throw all their votes to women, Della Volpe said. “They’re disproportionately undecided and if women decide to go Coakley-Healey and continue to go to Goldberg, then obviously that would be more than enough to overcome a 5 percent [gap with Finegold],” Della Volpe said. Coakley continues to dominate the female vote, claiming 50 percent of their support, to Grossman’s 30 percent. She also leads among men, though, claiming 42 percent to Grossman’s 32 percent. The standalone tracking poll interviewed 400 likely Democratic primary voters over two nights, Sept. 2-3, for a margin of error of 4.8 percent. The sample and survey time differed from the Globe’s prior 13 polls and focused on Tuesday’s hotly contested Democratic primaries, waiving the hypothetical matchup with leading Republican Charlie Baker. Past polls have interviewed 605 voters over two consecutive weeks, then homed in on about 360 of respondents who say they are likely to vote in the Democratic primary. For the Democratic primary results, the polls previously had a margin of error around 5.2 points. In the primary for lieutenant governor, among likely Democratic voters, Steve Kerrigan leads with 20 percent, to 8 percent for Mike Lake and 6 percent for Leland Cheung. When undecided respondents were pressed to say which candidate they were leaning toward, Kerrigan opened up his lead to 14 points, claiming 23 percent to Lake’s 9 percent and Cheung’s 7 percent. Still, the majority of voters — 60 percent — remain uncommitted to a candidate for lieutenant governor. Karyn Polito is running for lieutenant governor on the Republican ticket. In the final days before the primary in the governor’s race, Della Volpe said it appears Grossman has not claimed the attention of the voters he needs to gain ground on Coakley. Pointing to Grossman’s favorable-unfavorable rating of 47 percent to 16 percent, he noted that only 63 percent of voters seemed to know Grossman. On Tuesday, Republican voters will choose between Baker, a former Weld administration official and head of Harvard Pilgrim Health Care, and Shrewsbury businessman Mark Fisher. The winners of Tuesday’s gubernatorial primaries will proceed to the November election contest, where they will face additional competition from three independent candidates, Evan Falchuk, Jeff McCormick, and Scott Lively. Stephanie Ebbert can be reached at Stephanie.Ebbert@globe.com. Follow her on Twitter @StephanieEbbert.